I’m not quite sure why I am so determined but when I have some new art to master I go full steam (or boil) ahead! I have been printing and dyeing so much that I vowed to myself to use some pieces to actually make something. I tend have note books all over the place so a journal is a great idea! 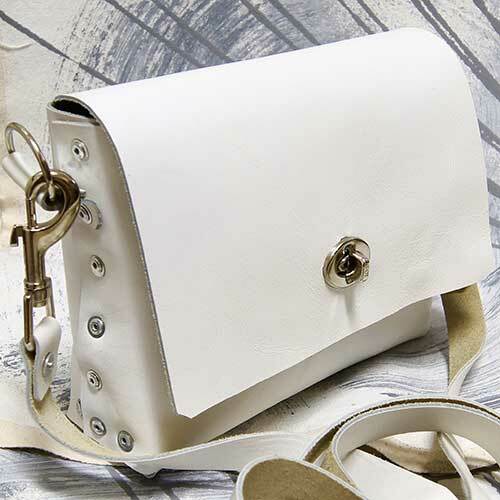 This versatile design also utilizes some up-cycled leather and could not be easier. 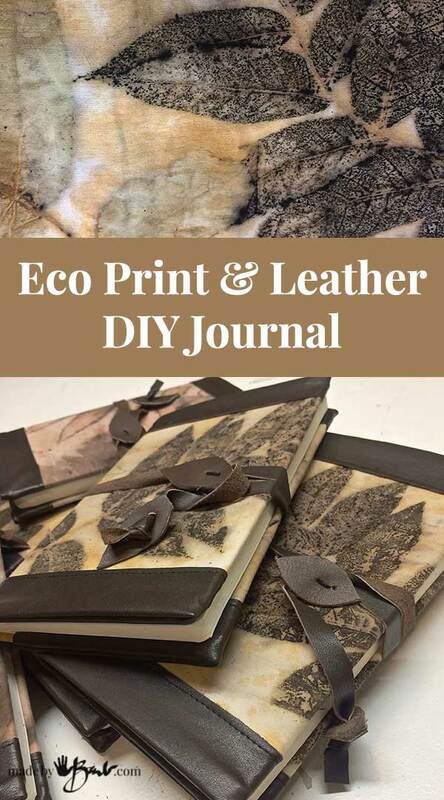 Create a piece of unique art and make this Eco Print & Leather Journal. I have always been a sewer (a person that sews, not the drain thing on the road!) so I rightfully already have a stash of fabric. Now, I also have a huge assortment of Eco prints. 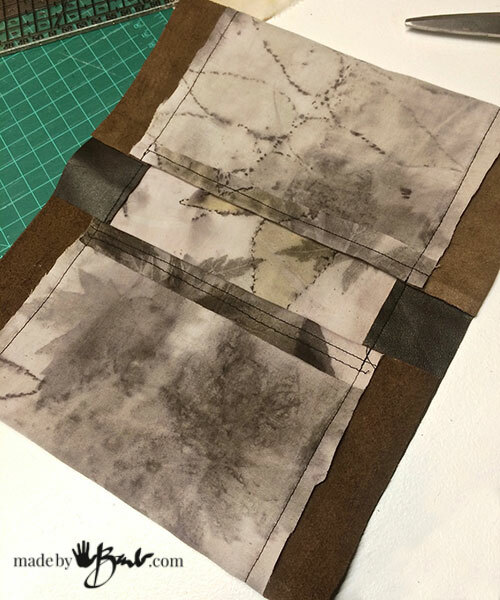 Each time that I use an ‘iron blanket’ there is the possibility that it will also have some great prints. After a few uses they become even more interesting. 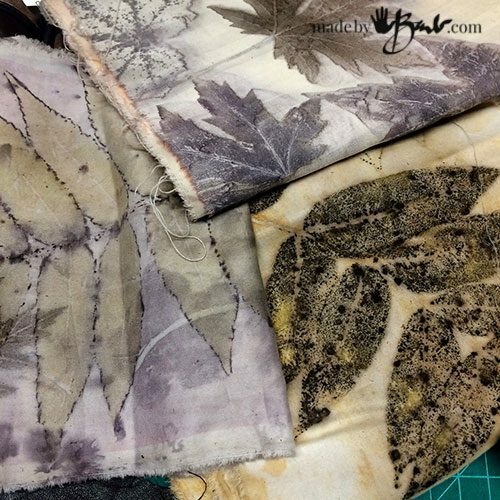 Sometimes one section of an eco print is just magically amazing and the rest not so much. 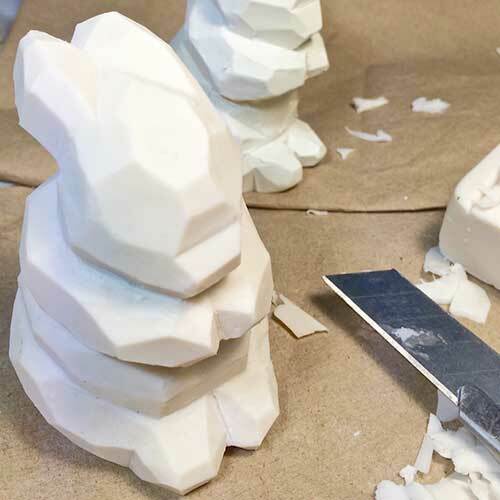 This is a small project so it can just use the best parts of the prints. I love journals but I tend to not want to write in them if they are really special. I keep it for something important that never seems to happen… So thus I designed it as a cover to be able to swap out the ‘insides’ and keep using it. 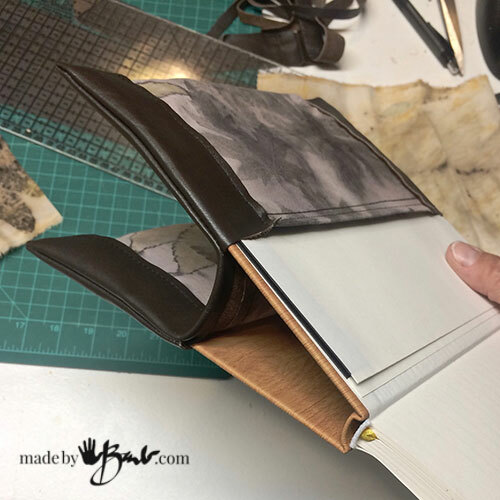 If you are a hard-core book binder then surely you can bind your own. 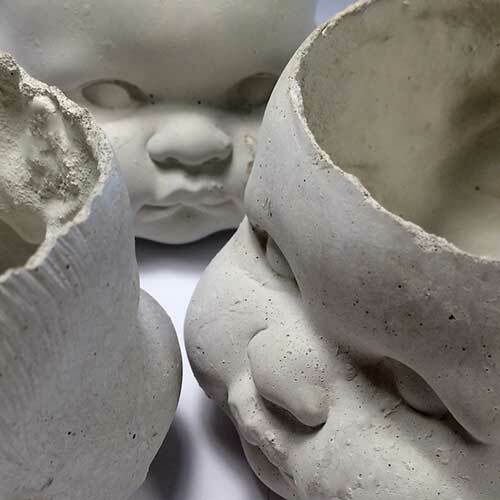 They are super lovely… and would warrant a noble use! But I’ll go the ‘quicky’ method here since I have more eco printing to do! 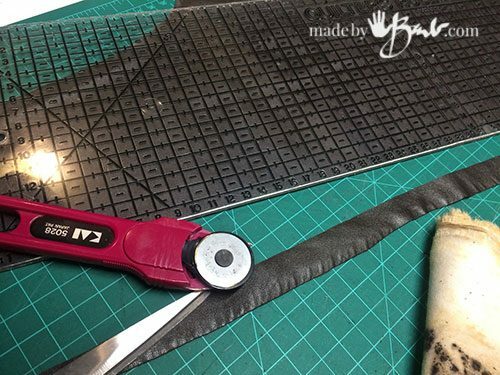 It is much easier to cut nice straight edges on leather if you use a rotary cutter and straight edge. Cut the strips that become the top and bottom edges at the length measured (see drawing above). Cut the Eco print fabric centre sections the same length as the leather. 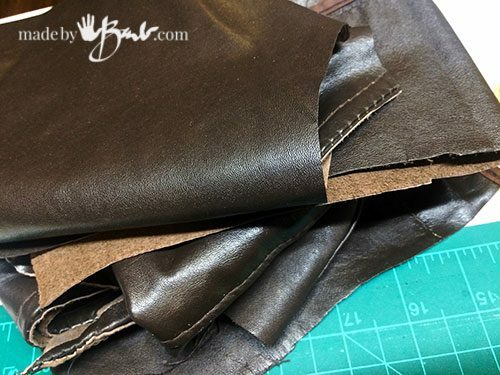 The width will be dependant on the height of the book minus the width of the leather strips + 1/4″seam allowance. 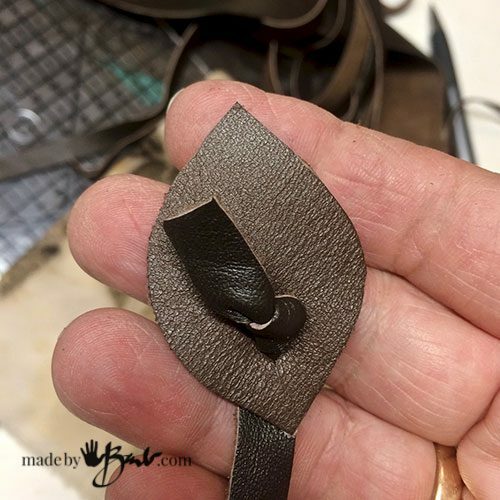 Cut thin (about 1/4″) strips for the cording at a length that allows you to wrap around the journal and secure around the ‘leaf button’. Cut some leaf shapes to attach the cording (thin strip for close wrap) to the middle back. 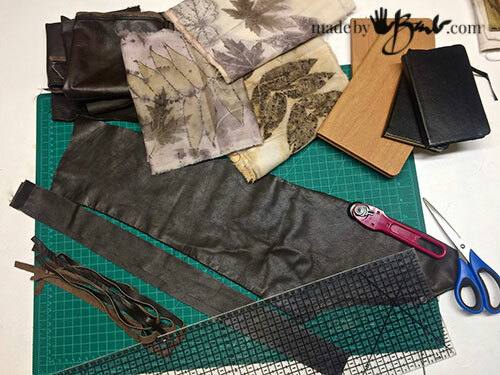 The strips of leather need to be sewn to the eco print pieces by overlap. If the leather does not slide easily it sometimes helps to put a piece of clear tape on the bottom of the foot. I am using a ‘walking’ presser foot. As a ‘button’ to wrap the cord around; similar to docket envelopes, use one of the the leaf shapes (or substitute a wood button). 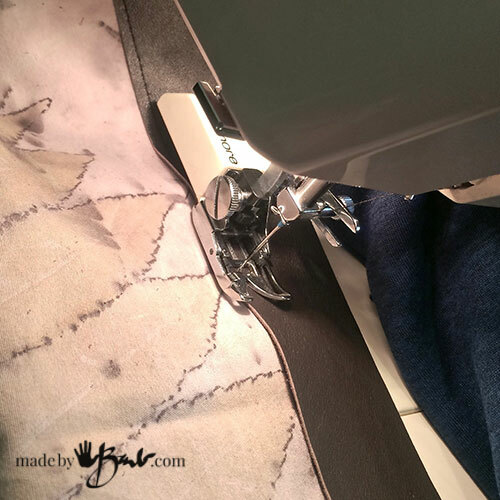 Sew on the leaf ‘button’ as buttons are sewn. The end of the cord is threaded through a hole in another leaf shape. It makes a nice finish for the cord. 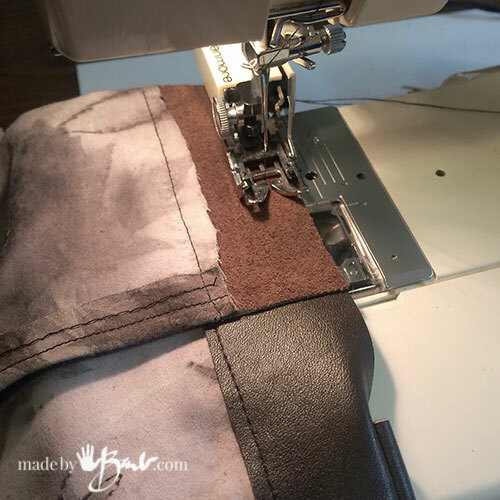 Sew these seams right sides together. Turn the cover inside out and use a pointy tool to push out the corners. See the placement of the ‘button’ and the cord attachment above. To be able to slide the cover on carefully bend the journal covers outward. The leather is quite forgiving and will stretch and mold quite nicely. 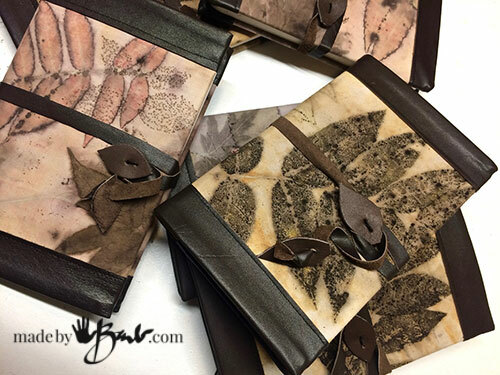 The design keeps the corners of the journal protected but showcases the eco prints. If need be the leather could also be pieced. The insides provide some pockets to stash extra slips of paper. Close the journal and wrap the cord. 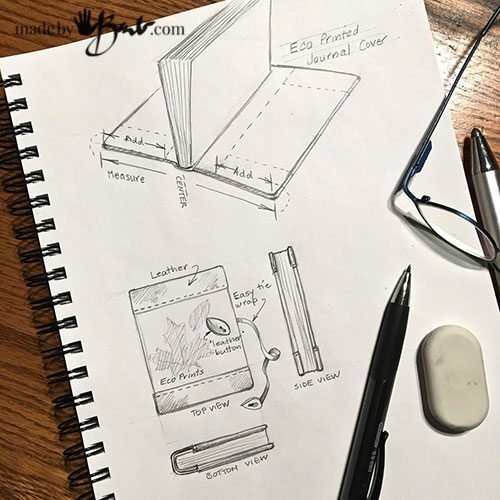 Slide a pencil at the side under the cord of your new Eco print & leather journal… and you are ready to take your noble notes! Or just gaze at the marvels that Mother nature manages. Printing leather. What a terrific idea. I’m thinking this method would make amazing placemats. Thank you for your excellent instructions and fun commentary..
Haha, I did not print leather. It is the cotton sheeting. I hope it doesn’t read as leather. I have read that leather will print but I have yet to source some to try. 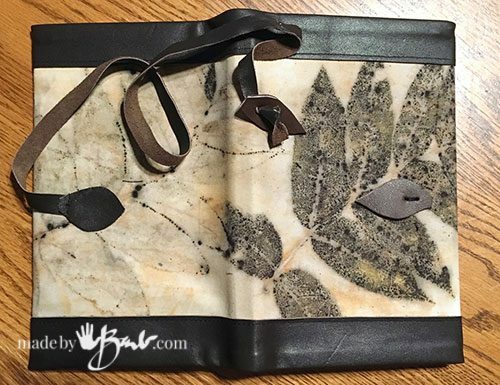 If making placemats I prefer ones that are washable so maybe leather is not the best idea. Unless you are the super neat kind of person! Youve created a truly beautiful journal cover. So wonderfully creative!!!! After I learn your process for eco printing, I am going adapt this to one of my journals. That’s kind. I will warn you though; eco printing becomes a bit of an addiction! And then before you know it… you’ll have tons of prints. I am in the midst of making a beautiful art quilt with a whole bunch. 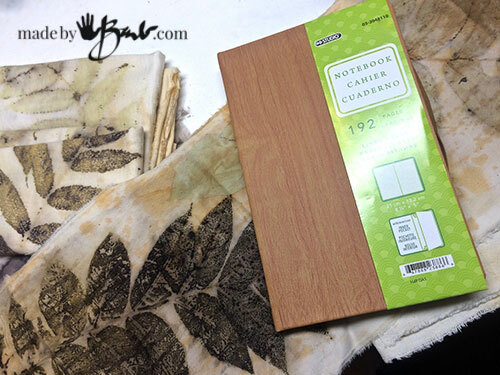 I love the ecojournal.What fabric worked best for you to ecoprint on? Is Eco print on silk and even so silk is very strong wondering if there might be a better fabric to create with. I would very much appreciate your input. Stunning work! I just love that combination of print and leather. Well done! 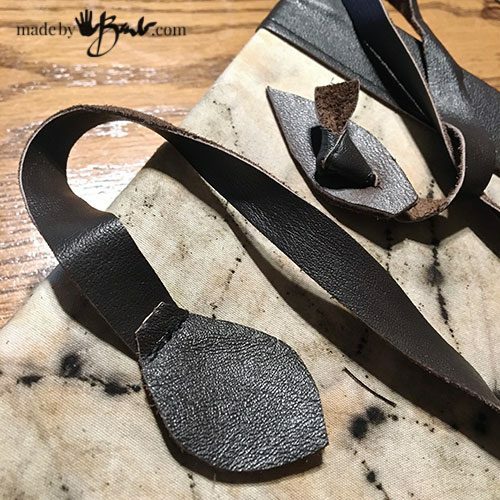 I love using up all my up-cycled leather! I’ll admit; I’m a ‘rustic’ kind of gal..